I do… BUT I have to tweet it first! 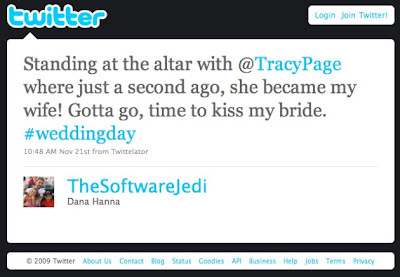 I surprised not only my guests, but also Tracy by pulling out my phone and posting on Facebook and Twitter from the altar during our wedding. I had her phone ready in my pocket, so when she asked for it I could hand it to her. No one knew about this except the minister, and myself. haha I love it! I’m sure many will complain about this — the groom has already responded to criticism on Twitter by reminding people that it was his wedding and it was all for fun! Good for him! Jared Leto & Kanye West?!? !